A kingdom crumbles without its ruler. The people fall to misery and desperation in the shadow of an empty throne. A father does what he must to save his son and his homeland in the absence of kings. Enter Garreth, ranger and former royal bodyguard, who embarks from his woodland home after defending it from the encroaching loggers of the Blackwoods Company. "The King is dead!" they had screamed at Garreth and drove the man to the capital of Amatharsus to resolve the most troubling statement in Malquia's recent history. 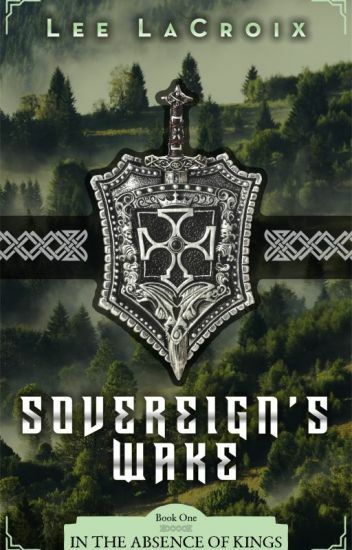 Together with his son, Novas, and daughter of a murdered blacksmith, Kayten, Garreth is hounded by bandits, cutthroats, and highwaymen, unleashed upon the countryside by the abolition of the Crown Aegis, defenders of the King, his land, and his people. Garreth unites with the remnants of the Crown Aegis to overcome the military, political, and economic oppression that the Blackwoods Company has imposed on Amatharsus and incites rebellion before the free people of Malquia succumb to crippling recession and the environmental destruction of their verdant nation. But can one man find the strength to challenge overwhelming odds when all hope is lost? Sovereign's Wake is first installment of the debut Fantasy series, In the Absence of Kings, by author Lee LaCroix.